Hand Pies have a long tradition in cultures all around the world. The English have their pasties, developed by loving wives for their husbands working in the mines in Cornwall in Southern England: the thick “croust” gave the miners something to hold onto without getting their lunch dirty with their grubby hands, and was tossed down into the mine shaft to keep the bad spirits away after the meal was finished. Pasties are still consumed throughout England with a variety of savory fillings, and were brought to Northern Michigan by Cornish Miners who moved there to work in the Copper Mines. 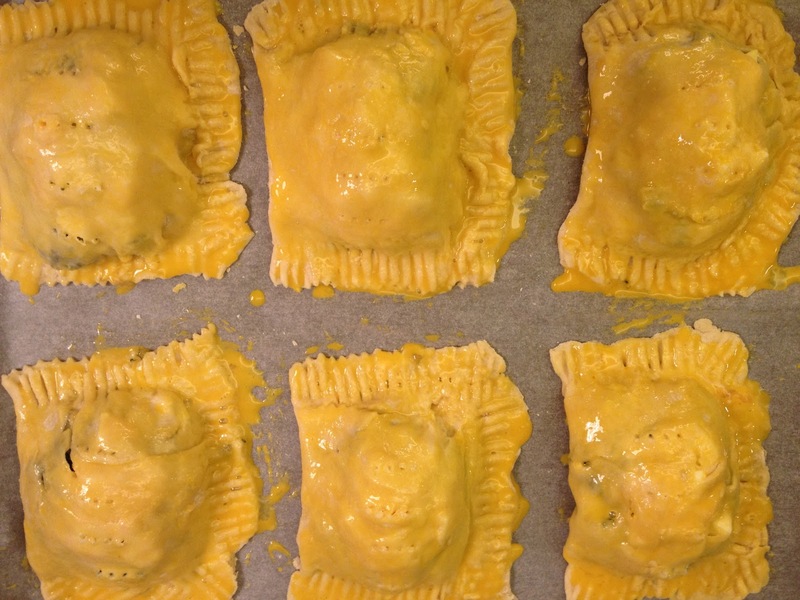 These were the hand pies of my childhood – except we never ate them with our hands. No – those pies were large enough to need two hands to hold them with a fair amount of overlap. They were filled with a savory blend of potato, carrot, rutabaga, ground beef, onion and salt and pepper, and served hot from the oven with ketchup. I still eat them this way! And when I finally visited London on an exchange program as a student, one of my favorite memories includes sitting on a cliff in St. Ives, eating a savory, paper-wrapped Cornish pasty as I looked out at the sun glinting off of the sea. The Scottish have Scotch Pies: a round sturdy pie with a thick crust and a savory filling of mutton, beans and the like – it was created around the Industrial Revolution and has since become a favorite for school children, sports fans, and late-Friday night revelers in need of a quick, cheap snack to keep their stomachs settled. The Spanish have Empanadas: a wonderful little pie with spicy meat or vegetable fillings – I first tasted one in the Ferry Building in San Francisco, and it disappeared so quickly that I had to buy another one so I could slow down and appreciate the beauty and perfection of the little gastronomic package. Around the world you will find them everywhere: Polish Pirogi, Russian Piroshki, Chinese Dim Sum – you have probably seen them more than you realize. Hand pies are fantastic for many reasons. They are portable and can be wrapped and taken anywhere. They are individual servings, so you can make a few or many. They look beautiful served individually on a plate with salad, or work well on a hiking trip. They freeze well and are open to a variety of sweet and savory fillings, limited only by your imagination. My hand pies use a simple butter crust and local Finnish ingredients: perch (ahven) and steamed stinging nettle (nokkonen). I have added onion because I like the flavor, and have used both rice and egg, inspired by the Russian piroshki. Perch, or Ahven in Finnish, is one of the most common fish in Finland. At the wonderful summer cabin that I’ve mentioned so many times in this blog, the many fishing trips yield large quantities of perch, so our freezer is stuffed with perch filets from last summer. The marinade is a the perfect way to infuse the fish with flavor – and in fact each segment of the pie is flavored individually which insures that the flavor is even and pleasant throughout. It makes a fantastic midday snack if you share it, or a great dinner with a green salad. One note: don’t be afraid of the long ingredient and directions list below. The prep work in steps 1-3 come together quickly and can be done the night before. Assembly on the day of takes about 15 minutes. Cover tightly with a lid or plastic wrap and place in the fridge to marinate for at least 4 hours or overnight. Bring to a boil; reduce heat and cover; and cook for 15 minutes or until water is evaporated. Remove from heat and cool completely. and cook for 12 minutes. Remove from heat; drain hot water away and fill pot with cold water. Allow to cool. Peel and chop eggs. Set aside. Note: Steps 1-3 can be done around the same time – either the night before or in the morning on the day you want to make the hand pies. 1/4 teaspoon fresh ground black pepper, or to taste. 1/2 cup / 1 dl shredded Edam, Gouda, or other mild white cheese. 5. Preheat oven to 425°F / 200°C. with a fork or a pastry cutter, cut the butter into the flour until it forms small crumbs. Add the cold water all at once and stir with a fork to loosely combine. Dump the dough onto a floured countertop and mix with your hands until smooth. Divide dough in half. 6. Roll one half of the dough into a 8″ by 12″ rectangle (for Europeans: this is about the size of an A4 paper!) Cut the rectangle into thirds. 7. Line up your filling ingredients on the counter in the following order: Rice, Fish, Nettle-Onion Mixture, Chopped Egg. Layer the ingredients, starting with the rice, on top of each other on one half of each dough third (see picture). You may need to cut the fish into smaller pieces so the filets are the right size. Press the ingredients onto each other firmly, and leave room around the edge of the filling so you can seal the packet when you fold the dough over. Once you have added all of the layers, fold the uncovered half of the dough over the filling and press to seal the edges. Press all around the 3 sides (exclude fold) with the tines of a fork to seal. Place finished pies onto a baking pan covered with parchment paper. Repeat with the other half of the dough and remaining filling ingredients. 8. Crack one organic egg into a small bowl and beat with a fork until well combined. Using a pastry brush, cover the surface of each small pie with egg. Pierce the top of each pie 4 times with a fork. Place in preheated oven and cook for 18-10 minutes until golden brown. Remove from oven and allow pies to cool for 5 minutes. Serve with a green salad. Makes 6 pies. Pies freeze well both baked and unbaked.